High density storage that provides efficient records management with convenient access from both sides of the shelving unit. All steel construction requires no special tools for assembly. Order starters and adders with or without wood decking. Provide maximum storage space with a minimum of setup time. Shelving uses an easy-to-assemble keyhole and rivet system for a strong, tight fit. Starter and adder units available with steel or particle board decking. Heights from 60" to 108". Records Storage Rack stores your file boxes safely and securely using high strength pallet rack starters and adders outfitted with wire decking. This high density vertical cube storage solution can be configured to almost any height or footprint. Box storage can be more complex than you think - what are your options? Rivet shelving systems aid in records management by providing organized, high density archive storage. Multiple decking options are available. All unit box capacities are based on a standard file box size. Utilizing teardrop style pallet racks rather than rivet shelving for records storage is typically for larger applications, such as archive warehouses, where many records are kept. 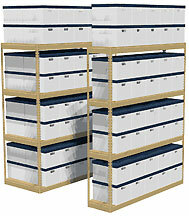 Archive storage racks can be configured to be taller, and to essentially pack more boxes into a particular space. They commonly utilize wire decks to support storage boxes, but can use other decking types as needed. Racks are often used for longer term storage, or in facilities where warehouse space is available for document archives.